Subway Series #1 and #2 2 are the result of an accurate process of re-drawing and blackening the original drawings on a notebook carried along when travelling by subway. The decision to temporarily change the work context, from the studio to the underground trains, had to do with the necessity to produce more automatic, less reflexive typologies of drawings. The result, a year and a half later, was a notebook filled with ackward morphologies that were xeroxed in order to preserve the stage of the original sketches and at the same time making it possible to continue drawing on the xeroxes of the same size (15 x 21 cm). In various stages the images were succesively redrawn and rexeroxed until they were altered to a degree that the original was no longer recognizable. 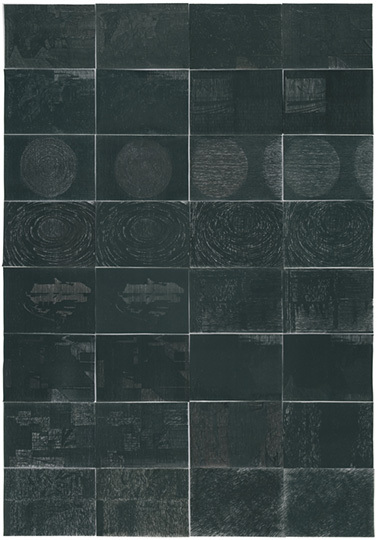 The process was repeated for 32 different drawings from the notebook, with the idea to arrange them on panels as it shows in Subway Series #1 and Subway Series #2. The panels are composed of 32 units organized in pairs. Each pair is the last and second-to-last photocopy of the same drawing, and each of them is unique because part of it has been drawn by hand. The two compositions share a certain cinematographic appearance like that of a storyboard or visual script.